This video demonstrates the smart IR technology built into a CCTV camera by comparing the video captured by a security camera without smart IR. The following video compares a CCTV camera with smart IR technology to one without. Security cameras with built-in smart IR adjust the intensity of the infrared LEDs based on the distance of the objects in view. Notice as this person moves closer, the camera with built-in smart IR adjusts the infrared beams with less intensity so that the man's face can still be identified. As the man moves away from the camera the infrared LED on the smart IR camera increases intensity so that the man can still be seen in the distance. 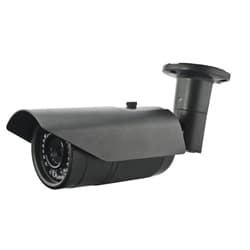 CCTV Camera Pros has a large selection of CCTV, HDSDI, and network IP security cameras with built-in smart IR technology. For more information about smart IR and the cameras that we recommend, please visit www.cctvcamerapros.com/smartir. Thank you for watching. Click here to learn more about the BIPRO-540L4 IR Security Camera used in this video.